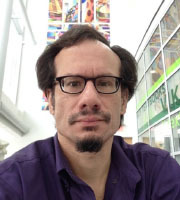 Kiril A. Streletzky, an associate professor in the Department of Physics, has been recommended for funding by the National Science Foundation (NSF) to establish a Research Experiences for Undergraduates (REU) Site at CSU. The project, titled "Synthesis, Assembly and Characterization of Soft Matter Systems," has been recommended to receive $312,303 in funding over three years. Jessica Bickel, an assistant professor in the Department of Physics, is the Co-PI. The objective of this REU Site is to involve sophomore and junior physics and engineering majors in meaningful interdisciplinary research projects in soft matter science/engineering. Soft matter is a subfield of condensed matter that encompasses a large variety of materials, from liquids used for transport and for directing assembly of other materials, to polymers used for electronic or mechanical applications, to biological materials that mimic nature's complexity. The REU Site is intended to encourage students to pursue graduate studies in physics and engineering. Each participating student will work directly with a faculty advisor for 10 weeks in the collaborative atmosphere found in the Department of Physics and the Department of Chemical & Biomedical Engineering. CSU's focus on Engaged Learning has cultivated a strong culture of support for undergraduate research on campus. REU students will benefit from this culture through one-on-one mentoring from experienced faculty and a variety of professional development opportunities. Research led by Dr. Valentin Börner, an associate professor in the Department of Biological, Geological and Environmental Sciences and a member of CSU's Center for Gene Regulation in Health and Disease (GRHD) was the subject of an article published online this month in the journal Science. Dr. Börner's team has uncovered new insights into the function of proteasomes in the cellular process of meiosis. In humans, meiosis is the process by which sperm and eggs are created, and the early stages of meiosis involve homologous chromosomes (homologs) pairing and then segregating from each other. Each half of the pair is joined by the centromere, which regulates and powers chromosome movement. Key findings of the research are that three primary interactions between homologs (pairing, synaptonemal complex assembly, and crossing-over) are controlled by chromosomally-tethered proteasomes. The team's findings provide an understanding of how cellular processes can be controlled by targeted protein degradation and how errors in the protein degradation process can impact human reproductive health including miscarriages and birth defects. Dr. Beth Domholdt joined Cleveland State University in August 2016 as Professor and Director of the School of Health Sciences. She holds a bachelor's degree in physical therapy (PT) from the University of Michigan, a master's degree in health occupations education from Indiana University, and a doctoral degree in higher education, also from Indiana University. Dr. Domholdt has spent 33 years in higher education as a faculty member and administrator, has presented at health professions conferences around the world, and is widely published. 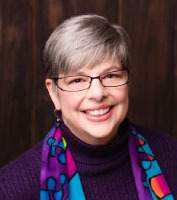 She is the original author of the textbook Rehabilitation Research: Principles and Applications, now in its fifth edition, and has been recognized as a Catherine Worthingham Fellow of the American Physical Therapy Association. Her current research focuses on how rehabilitation professionals participate in population health activities related to health promotion and disease and disability prevention. As a native of Ohio, her new role at CSU is the ideal way to return to her geographic, family, and disciplinary roots. 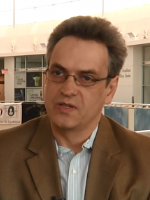 Research by Professor Richard Perloff is the focus of the latest installment of the Featured Researcher Video series. 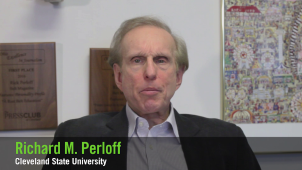 Dr. Perloff is a professor at Cleveland State University in the School of Communication. His research explores the intersection of communication in psychology and along the interface of mass communication in political science. Click here to watch. Prof. Dan Simon from the Department of Electrical Engineering and Computer Science (EECS) has been teaching short courses at the Johns Hopkins University Applied Physics Laboratory (APL) every year since 2009. Each year he teaches a three-day course to an audience of engineers and scientists on the topic of state estimation, which is the subject of a graduate-level text that he wrote in 2006. Prof. Simon has also taught his short course at a university in Austria and to an audience of South Korean defense contractors. Prof. Simon teaches his course through the Applied Technology Institute (ATI), which coordinates dozens of technical short courses each year. Interested science and engineering faculty can contact ATI to see if their field of expertise would be a good fit for future ATI courses. Gary Dyer, a professor in the Department of English, is widely recognized for his scholarship dealing with early nineteenth-century British literature, book history, and relations between literature and law. Professor Dyer has published 17 articles and one authored book, British Satire and the Politics of Style, 1789-1832 (Cambridge University Press). His edition of Thomas Love Peacock's novel Melincourt (1817) will be published soon by Cambridge. His current research concentrates on the intersection of press prosecution and intellectual property. He is finishing a book titled Lord Byron on Trial: Literature and the Law in the Romantic Period, which deals with three works by the most famous poet of the nineteenth century that were brought into court in the early 1820s. A jury concluded that Byron's The Vision of Judgment was a criminal libel, and a judge ruled that because Cain and Don Juan: Cantos VI, VII, and VIII arguably were offensive, the court could not suppress unauthorized editions. Professor Dyer argues that legal constraints on expression in early nineteenth-century Britain functioned in an uncoordinated, inconsistent, and often contradictory manner. A paper extracted from Lord Byron on Trial, titled "Lord Eldon, Lord Byron, and the Practical Public Domain," was the subject of a session at the 2015 conference of the International Society for the History and Theory of Intellectual Property. In summer 2016 Professor Dyer carried out additional research for Lord Byron on Trial in London at the National Archives of the United Kingdom, with support from the CSU Faculty Scholarship Initiative (FSI) program. 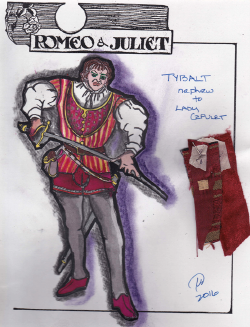 An innovative presentation of Romeo and Juliet will open on March 2 under the direction of Michael Mauldin and with sets and costumes designed by Russ Borski, both associate professors in the Department of Theatre and Dance. The focus of this spring's Romeo and Juliet will be an exploration of Shakespearean Original Practices, concentrating on acting choices contained in Shakespeare's verse and relying heavily on working with the First Folio edition of the play. Many scholars contend that the First Folio gives us the closest notation possible of how the original company may have acted the texts (word color, emphasis, verse play) before modern editors "corrected irregularities in spelling, capitalization, punctuation, etc." In keeping with Original Practices, this production will not be contemporized and will be presented with a traditional festival stage with a thrust playing area that is surrounded on three sides by audience with multiple entrances that allow for a seamless flow of action from one scene to the next. The actors, undergraduates in the Theatre and Dance program, will be costumed in Elizabethan clothing constructed in the department's costume shop to create an authentic Shakespearean evening for the audience and an informative and educational production for the students. Dr. Mauldin believes that Shakespeare's actors were swift and dazzling, and hopes to bring the excitement, fun, and heartbreak that Elizabethan audiences witnessed to Cleveland audiences in the Outcalt Theatre. Drs. Moo-Yeal Lee and Wenbing Zhao have each submitted an application to participate in the next I-Corps@Ohio cohort. The program offers a $15K grant to successful applicants for entrepreneurial training and support to develop their technologies. The deadline to submit proposals for 2017-2018 internal funding programs is approaching fast! The application process and requirements have significantly changed since last year, including earlier submission deadlines. In order to assist in the preparation of successful applications, the proposal evaluation forms are included at the above web sites. For more information please contact Joy Yard, 687-9364, j.yard@csuohio.edu or Dan Simon, 687-5171, d.j.simon@csuohio.edu. The Office of Research has revised and expanded its online resources to help you write winning proposals. The new web page provides quick access to grant application guidelines, proposal writing tips, commonly required University information, and templates for supporting documents required by NSF, NIH, and others. If there are online resources that you frequently use that you believe would benefit other researchers at CSU, please contact Ben Ward. For additional proposal assistance, please contact the Office of Research.